Reproduction envelope used to hold the small Instruction Booklet (or "Operators Handbook") used with solid-state Williams pinball games 1977 through early 1980s. 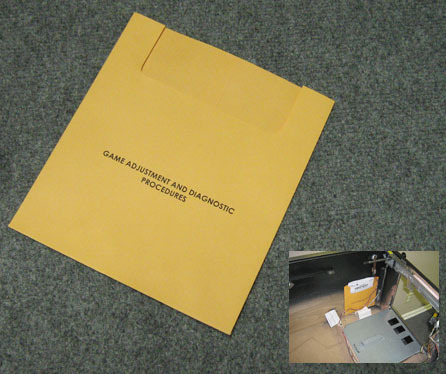 Can be installed and used in later-model games that also used the small 8-1/2 x 5-1/2 Instruction Booklets. Often torn, damaged, or missing from most games. Staples to inside wall of main cabinet and holds Instruction Booklet for easy access. WILLIAMS: Alien Poker, Barracora, Black Knight, Blackout, Firepower, Flash, Gorgar, Thunderball, more?